Everyday I start a full system scan. NIS completely disappears from my screen after awhile. I then have to restart my computer and begin the full system scan again. After that the scan completes successfully. No one know's what I can do? There's no error or at least none that I can see. NIS main and scan interface just disappear. 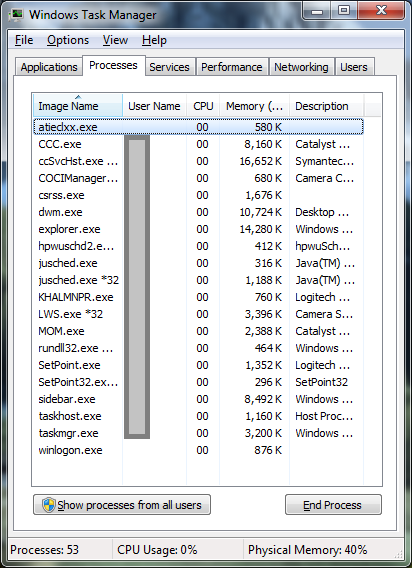 After it disappear, if you open the Task manager do you see the norton services (2 ccsvshst.exe shoud be there)? How did you install NIS 2010 on your Windows 7 system? Did you upgrade from Vista to Windows 7 with NIS 2010 installed? I didn't check the task manager. But the NIS system tray icon remains. No, Clean install. Deleted Windows 7 Ultimate RC1 32-bit. Installed Windows 7 Ultimate 64-bit OEM. Downloaded Norton installer from Symantec and installed NIS 2010. I have a valid license so it's not the trial version just to be clear. 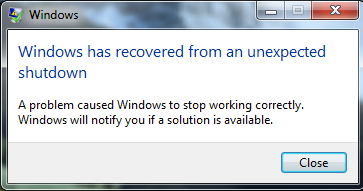 I'd also like to add this happens on Windows XP Pro and Vista Ultimate 32-bit as well. But generally on those two OS's Symantec framework has stopped working when this issue occurs. Are you running any other security software alongside NIS 2010 on all three computers/OS? If not, do a manual 'Live Update' from the Norton Window. On my XP Pro and Vista Ultimate hard drives I have Ad-Aware Free Anti-Malware 8.1.0 most of it's real time protection is off. So no not all three hard disks have the same programs. Yes I have NIS 2010 build 17.1.0.19 on all three hard disks. You "deleted" Win7 RC1 32bit? What do you mean deleted? Did you format the disk or you just deleted the Win directory?????? I used the OEM disk with Windows 7 Ultimate 64-bit to delete the hard drive. Then installed Windows 7 Ultimate 64-bit on the hard drive. Which formats it for me before it installs. I'm not stupid. In case you haven't noticed my signature I have 3 hard disks. I'm running a tri-boot system here. This is a Norton problem and obviously Symantec doesn't care too much. I've been a Symantec customer since 2004 or possibly longer. I've had NIS cause my system to restart itself. I've also had like mentioned above where NIS just disappears during a full system scan. I've also had Symantec Framework stop working and error out. This isn't my system causing it because it happens on three different hard disks. Leave the technicial log into your machine remotely , demonstrate him/her the issue and he'll get the necessary information so that Symantec developers are notified. I must say I am very pleased by (most) of the support technicians . Hope they can help you. It's difficult to reproduce this issue. It doesn't always happen it's completely random. For example today NIS crashed and gave me a "write to memory error". The only reason I have Ad-Aware Anti-Malware Free is because one program may not catch everything. As far as the online support tech's go. This is what they'll do. Remote access my computer, Run NRT (Norton Removal Tool), Restart my computer and install NIS using the web installer. Doing that won't cure my issue. But I think I'll try it and see what happens. The reason it's so odd is because it happens on all three hard disks. If it was just one I wouldn't care. I figured someone on this board might have a similar issue or know a solution. No , if you don't want to reinstall your Norton , they won't do it . When they are logged on , you can tell them to do or not to do. Now after I get that if I run the Full System Scan again it'll complete successfully. So I've downloaded and ran NRT (Norton Removal Tool). I'm now in the process of re-installing NIS2010. I hope this problem doesn't continue. I bought a new subscription for 2010 since I was using 2010 for the remainder of my 2009 subscription. If anyone else has had this issue or knows how to solve it please post thanks. I may have got the wrong picture here, and if I have, just ignore this post. Reading your post I get the impression that you're running a Tri Boot system with three Different Hard Drives on one Computer, with a different OS system on each. And each time this happens, you are doing a FULL Scan. On each OS system in turn, run a 'Custom Drive Scan, i.e. only have one drive ticked, and see if an individual drive is causing your problems. You can repeat this with each individual drive selected, using each OS system in turn. A lot of work, but you may be able to narrow it down to an individual Drive being scanned. As I said earlier, if I've got wrong picture, or you've tried this, Just ignore. At this point anything is worth a try. I did the NRT and it didn't help at all. It still disappears on me. So I restart my computer. Then it only scans 50% of the files. I'm assuming because it already scanned the other 50%. I have it set to exclude drives D: and E: on each OS. I'll try your suggestion later today. It usually happens in the first 5 - 10 minutes of the full system scan. Edit - I forgot to mention that it is really bad on the OS which its the only security software running. The other two with Ad-Aware Anti-Malware Free it actually works better. Ok that idea didn't work It stopped the scan again and disappeared. But the ccSvcHst.exe is still running. I don't know about Win 7, but I do believe that there should be 2 ccSvcHst.exe running in task manager. If you have only 1 running, there is a strong possibility that you have some sort of bad malware running that is hiding. Malware could very well be the reason why your scans are closing up. I would suggest running first a complete full scan with Malwarebytes and see what that comes up with. It may be necessary for you to run a Gmer scan also. Please run the Malwarebytes scan and post the log here. Download the free version, install and update then run a FULL scan. After the scan completes you should post the logs back to this thread. It is a safer location to get the program from than malwarebytes themselves because the malware writers sometimes block the security websites. You might have a rootkit. It's hard to believe I'd have the same rootkit on all three hard disks. The MBAM shows 0 infected objects. The same issue occurs on all three hard disks. Windows 7 has two ccSvcHst.exe in the processes. One must be hidden though(as its not displayed in the Task Manager). Because GMer shows two. The problem seems to have cleared itself up. Thanks for the effort put forward trying to solve my weird issue. I believe the problem is caused by a subscription running out. I had several days left on my subscription. But since I've activated my new product key I have no zero issues on all three hard disks. It may have all been caused by either the pop up telling you your subscription is running out or simply the fact my subscription was running out. Hopefully my issue is gone for good. Maybe Symantec needs to take a look at this. Sorry I can't provide more than speculation in regards to this issue. Just today I was running the Full System Scan on my Windows 7 hard disk. Symantec Framework closed and when I returned to the computer a UAC window was showing. Usually when I run a full system scan I right click and run as administrator. As I do with most programs. I wish there was a solution. Since it's happening on 3 hard disks. It's not my system obviously. Do you get same problem if you left click Norton Taskbar Icon -- Scan Now -- And then click on Run Full System Scan ? I have always used this way, and not had a problem so far. Takes ages, but does complete. This has been happening since NIS 2009 and now on 2010. On 2010 it's getting worse and worse. I'll try your suggestion. One day I'll have to break down and use the chat support. But I think they'll just reinstall NIS and I've already done that. In the meantime I will use your method with my 'Windows 7 (Professional) 32 bit' and 'NIS 2010 vers 17.1.0.19'. Haven't got the 64 bit though. So next I'll try it on the Windows XP sp3 32 bit Drive. It'll take time due to drive sizes and number of partitions. If I get a problem, I'll let you know. Waiting for a chat support technician right now. I was going to try a phone support call but I figured how could they help if they can't see what's going on? lol. That chat support tech was no help at all. He said there are no logs that can show him anything. He said that my product is currently working fine. That may be so but it has this problem everyday. He also said that Symantec Framework errors are caused by Symantec conflicts. He recommended I uninstall Ad-Aware Anti-Malware Free Edition from my two hard disks. How could that program affect my hard disk that does not have that program? So I don't know what to do. I'm going to uninstall that program. Then if this happens tomorrow if I can I'm going to try and get in contact with a Chat Support tech again. I can't always access the Norton interface after my issue happens. It's like no one from Symantec wants to help. So what am I paying for? I have asked a mod to remove the solved marking since it appears that your problem isn't solved. Maybe after it is removed, you will get some more responses. I just don't get it. I've never had this problem before. Since the chat tech couldn't reproduce the issue he didn't do anything to help. I don't know what else to do but contact the chat tech again after the issue happens. So they can see the state my computer is left in after the issue happens. You can communicate both items with the support people and maybe they can help you then. I'm sorry we're not getting you anywhere with this. Do you ever see your computer bluescreen? Can we set it so it'll hold a bluescreen until you can note the error if it occurs? Go into system properties (right click "computer" and choose properties, go to the advanced tab,under startup and recovery click "settings",and turn off "automatically restart". Then repeat your full system scan. If it bluescreens, take note of the error type and the name of the driver (a file name ending with .SYS). No bluescreens. I'm getting really angry here. Today alone on my Windows 7 hard disk NIS 2010 has just closed on me during a Full System Scan. Minutes later the systray icon returns. To me it's like NIS closes and restarts itself. If that makes sense. I've had 2 chat techs in my system and they can't do anything. If my system has an error. When it gets back to the desktop a windows error appears. That error directs me to an IE page telling me that my system shut down because of Software/Hardware error or something along those lines. Its not my hardware and please do not suggest that. If it was my hardware it'd occur not just when running NIS. Something is wrong with NIS 2010 and there is no fix. I forgot to add it closed 3 times in a row. SGFC, I'm trying to research this a bit more but from reading this thread I'm seeing two different, possibly related, issues; in the first, the scan window closes and the tray icon goes away and comes back, in the second, you get a message about windows recovering from an unexpected shutdown. In the second case, does the system actually reboot before you get that message? If it does reboot, have you change Windows' automatic restart option per bwoirhaye's instructions? No I haven't tried bwoirhaye's suggestion. It rarely causes a restart. But I'll try it. By turning off automatic restarts what will this accomplish? Sometimes I get that window from NIS asking to scan my Norton for issues. It usually says there are no issues all scans are normal. The Norton Internet Security service terminated unexpectedly. It has done this 1 time(s). The following corrective action will be taken in 120000 milliseconds: Restart the service. Could this have been the cause of all my problems? By turning off automatic restart, there may be some information left on the screen that could help understand what the problem is. Potentially. You didn't answer one of my questions, though. When you get the recovered from an unexpected shutdown message, did the system actually restart just before getting that message? Yes the system shuts down and when I get back to the desktop. I get the unexpected error message. When I click the solution button on the error it says "Hardward or Software caused your system to shut down unexpectedly" or something along those lines. I know it's not hardware because this only happens when I run NIS Full System Scan. I have a tri-boot system. So if the system restarts on my other hard disks I always end up back on the default OS which is Windows 7. I hope thats what you were looking for. That helps a little. Was there an error number or any other description of the problem on that screen as well? bwoirhaye should've also asked you to switch to kernel mode dumps when you supressed automatic restarts. If your system is already set to product kernel dumps, I'd like to get the dump file from you. If you aren't, I recommend that you switch to producing kernel dumps and the next time the problem occurs you can send the file to us. Until we get the dump, though, please go to a command prompt and run "fltmc instances" and reply with all the text that is displayed. This may help to identify what is unique about your system that is causing this problem. It is set to Kernel Memory Dump is this correct? When I went to the location of this dump file it said it does not exist. Yes, a kernel memory dump. It's unfortunate that the file isn't there, we'll have to wait for the next BSOD and see if it appears after that. When the BSOD occurs, you should see a sort of counter indicating that memory is being dumped and you have to wait for that to finish before restarting your system. Unfortunately the fltmc output looks pretty normal so there's no hint there. Looks like we're going to have to get a dump file to gain much more progress. Where do I send the MEMORY.DMP to? The MEMORY.DMP is 437MB it would take forever with my upload speed to upload.